Ever since their first visit to Japan, the Ventures remain as no. 1 instrumental group on our mind. Don Wilson is an established guitarist of the Ventures. 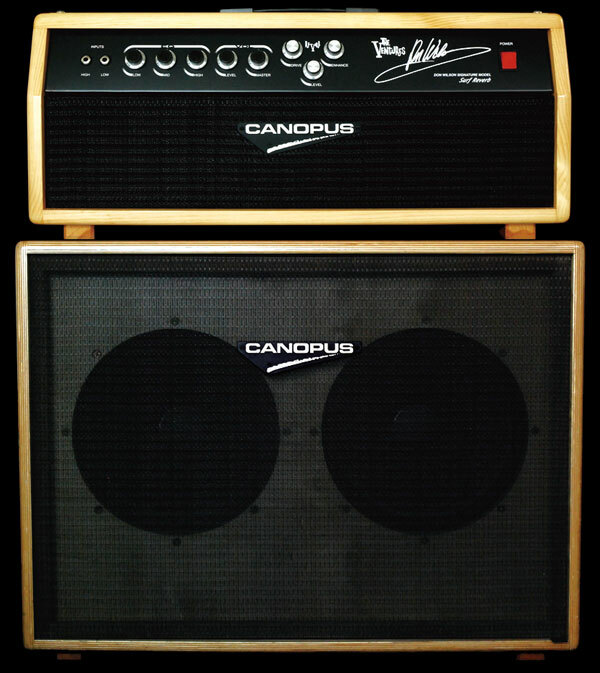 The amplifier development project with Canopus has launched with the commitment that we develop an ultimate amplifier agreeable to Dom himself. 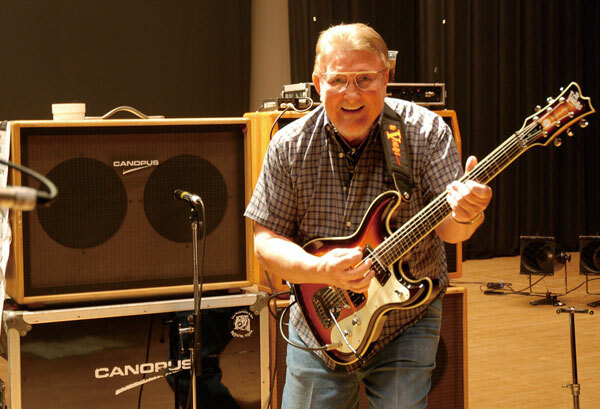 The primal goal for us upon the development of Don Wilson’s amplifier was how to substantiate “clear and big power” he advocates. “Clear” should not be merely undistorted sound. It takes truly beautiful and comfortable natural sound and tone. By the same token, big power is not merely high-output. Solid presence, sharp attack, rich sounding and reach in the hall are taken into consideration for the creation of powerfulness in its true meaning under limited output level. The key factors that determine the sound are careful circuit design and rigid selection of components. In the field of “tube” amplifier, to exchange into the arranged parts for better sound on existing amplifier, (typically known as group tube) is already practiced. However, upon our engagement for “Don Wilson Signature Amplifier,” we maintained our clear policy that we will not make a slightest compromise to musicians and designer from all parts to all details with extensive consideration of balance, disregarding cost factors. 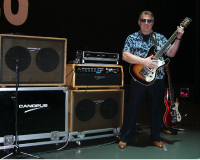 The first request Don made to us is to make his huge system into compact outfit so that amateur musicians can bring. At the same time, it should be durable transistor amplifier to be trouble free in long tours. Don obtained his reverb sound out of separate Tube-works. For output, he used Peavey for dry (normal) sound and Roland Jazz Chorus for reverb sound in order to make his to reverb sound clearer. We developed original circuit in one cabinet to realize more powerful and clearer reverb sound. We also built-in reverb unit in head part. This way, we managed to integrated his complicated huge system into one set and realized compact version of his system. Compatible to All Guitar, No Compromise to Lead Guitar and Side Guitar. Don’s second request was that the amplifier should be compatible to all guitars with no compromise to both lead guitar and side guitar. We set a big difference in input level between high and low. A musician can choose high level input for low-level pick-ups like Jazz master type. He can choose low input for high-level pick-ups like Mosrite or Aria’s Ventures models. This enables stabilized big power from one amplifier without distortion and we realized “clear and big-power” sound he had requested. When a musician put his lead guitar in high input, he can gain tube like mild overdrive sound thought it is a transistor amplifier. This amplifier is compatible for both lead guitar and side guitar without making any compromise in sound. We use Accutronics (Hammond: Made in U.S.A.) reverb unit in 2 springs model and 3 springs model in dual setting to reproduce the sound of 60’s in more effective reverb sound. Generally level control of reverb unit is set only on drive side. We set level control on the pick-up side, too. This enables various reverb sound effects form typical the Ventures electric guitar sound of 60’s Don creates up to deep and long sound like that of the Shadows. Newly equipped enhance control will do more than standard tone control. Under low level, it limits high tone and emphasizes low tone. Under high level, it reduces low tone and emphasizes high tone. The enhance control devise will make much more colorful tone control than those existing ones. We tried every tube for reverb drive in order to respond Don’s severe concern on reverb. We concluded to use 6BM8 (Svetlana, Made in Russia) which had passed Russia’s strict military standard. We obtained an unprecedented deep reverb effect with this selection. We chose ceramic type (Made in Russia) for pin in the socket part to hold the above tube. This type is durable against high temperature and reliable under long hour performance. We adapted special device to lock reverb unit’s spring to avoid the reverb unit’s damage during the transportation. This type of troubles has substantially solved with this device. We adapted CLIF input jack (Made in U.K) for smooth handling. It will transmit delicate musical expression of guitarist perfectly into the amplifier. We adapted SWITCH CRAFT output jack (Made in U.S.A) for effective transmission. This type allows very little contact resistance and allows almost no power decline in big power performance over long period of time. We adapted Motorola’s TO-3 (Made in U.S.A.) for final transistor to secure beautiful musical expression. We adapted large EI core power trans with shortening for power supply from the initial to the final stages. It allows stabilized power supply even in high power peak situations. It will secure powerful sounding feel and impact under any circumstances. We adapted large heat-sink (radiation panel) for sustainable power supply in long hours of performance. We adapted glass epoxy type. This type is most durable against heat and aging because of its non-elasticity. We adapted large C.T.S (Made in U.S.A.) for volume part (P.O.T.). Volume part is the most heavily used part and this selection will secure exceptional durability. We adapted beautiful and durable pine plywood from Northern Europe for amplifier head. We use pinewood plywood for speaker cabinet. This material provides better sound projection, clarity and resonance compared to regular particleboard. We realized outstanding sound projection in a large hall over 1000 audience.